I have worked with many people over the years in this business. I, like everyone, have had both good and bad experiences. In recent years though, the majority of my experiences have turned good based on one simple fact. I am friendly to my fellow DJs. Like you, I am in the business of saying “yes” to clients. We all do aim to please, right? Do we do the same with our peers? The circle of DJs I network with are great about trading equipment and helping each other out with events. Most of the time we help with the intention of being compensated; however, once in a while, we do things for free. Why not when it can be as simple as something like allowing a fellow DJ to borrow a laser light. Generosity builds strong bonds and creates an unofficial barter system amongst my DJ brethren. Last Halloween, I was DJing a party that required extra trussing, lighting, and plasma TVs. Normally, if we don’t have a product, we rent it from another DJ. But, in this case, I was owed enough favors that I could get everything I needed for that event without it costing me a cent! Even more recently, I was stuck in a worst case scenario for one of my Sweet 16s. The event was 30 minutes away and it was raining like crazy. I had loaned a light to a fellow DJ and he was waiting at his house for me to pick it up. Horror struck when I hit the parkway and it was backed up with over an hour of wait time. I wondered if this generosity thing went both ways. I called that DJ and found out that thankfully it did. Without a second thought, he offered to drop it off at my event for me. Even better, once he got to my gig, he didn’t just drop the lights and run, but actually came in and helped me set up before my party, saving me tons of time. It ended up being one of the best Sweet 16’s I had in years! The good I had put out into the world returned to me ten fold. Networking with other DJs in the spirit of helpfulness and generosity is something we should all strive to accomplish. We need to watch each other’s backs and work hard to make sure that each one of us is able to provide the best service possible. At the end of the day, the entire industry benefits. To quote one of my idols, Sean “Big Daddy” McGee, “Smile as loud as you can!” I believe that everything we do comes back to us. 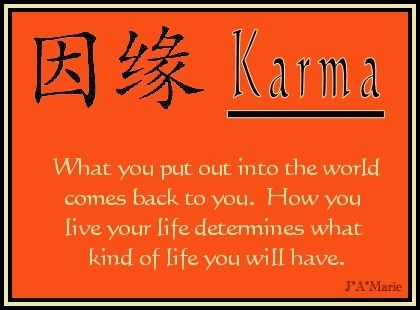 In this case we can call it DJ karma.